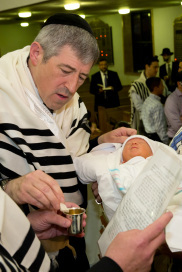 The Bris ceremony can be customized, to a certain extent, to accommodate your needs. In a strictly observant setting, where all the guests are familiar with the customs and traditions, it is common for me to do a straightforward ceremony without comment. However, I perform many Brisses where family and friends are unfamiliar with the procedure. In these situations, I often provide explanations, stories (and sometimes a song or two!) to allow participants to feel more part of the service. I am not a comedian. I do not approve of “Borsht Belt” type off-color humor at a Bris. A Bris is a Covenant between God and the children of Abraham; it is a happy time, but a serious time. Let me help you create the proper atmosphere of traditional joy. I use sterile gloves and a single-use sterile scalpel. All my other instruments are sterilized in an autoclave. The dressings that I put on the baby after the Bris are autoclaved as well. Circumcision is a Commandment from God. It is also a surgical procedure, which needs to be done carefully and hygienically. (Safeguarding health is also a Commandment from God!) The Talmud states that for health reasons, the initial blood from the incision needs to be suctioned away from the wound site. There are various means of accomplishing this suction. The method I use (sterile tube) satisfies the requirements of orthodox authorities such as Rabbi Moshe Feinstein1, the Chazon Ish2, the Chofetz Chaim3, Rabbi Yitzchak Elchanan Spector, Rabbi Sampson Raphael Hirsch and others, without compromising sterile surgical procedure. Feel free to call me for more information about these or any other questions. Click here for the 1st page of the Biur Halacha quoted above. Click here for the 2nd page.